To determine the size your dog needs, measure the dog's girth. Black Shearling Fleece (looks like lamb fleece) lining. 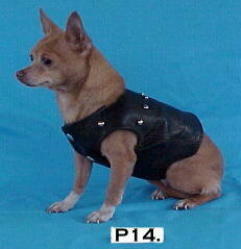 a collar that can be turned up for extra weather protection. 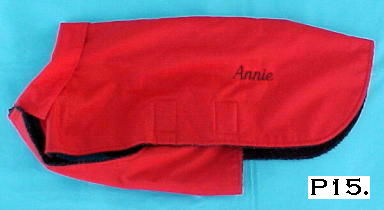 Have your dog's name embroidered on it's coat. Only $5.00 extra. Sizes 8 to 20 Only $5.00 Extra. Which Size Of Coat Was It? 8 in. 10 in. 12 in. 14 in. 16 in. 18 in. 20 in. Which Color Of Coat Was It? Sizes 22 to 34 Only $5.00 Extra. 22 in. 24 in. 26 in. 28 in. 30 in. 32 in. 34 in.